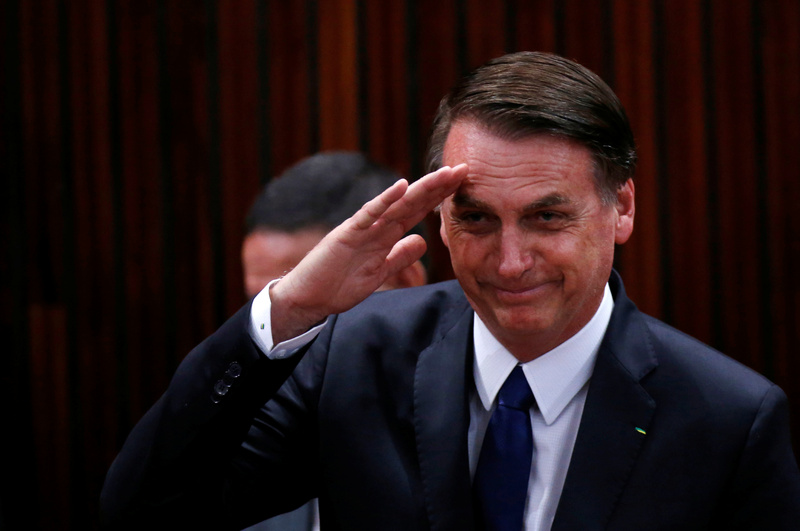 Brazil's President Jair Bolsonaro salutes before receiving a confirmation of his victory in the presidential election in Brasilia, Brazil December 10, 2018. Brazil's new president, Jair Bolsonaro, issued an executive order on Jan. 2 putting the country’s agriculture ministry in charge of land claims by indigenous people, prompting concern among environmentalists that his government will open up ecologically sensitive areas such as the Amazon rainforest to greater commercial exploitation. Bolsonaro also signed an executive order on Jan. 1 to give his government potentially restrictive powers over international and nongovernmental organizations working in the country. He has accused NGOs of exploiting and manipulating indigenous people. The temporary decrees will expire unless ratified within 120 days by Congress. Bolsonaro, who took office on New Year’s Day, tweeted on Dec. 29 that he planned to issue a decree allowing all Brazilians without criminal records to own firearms. That would represent a loosening of the country’s gun laws, one of his electoral pledges. Folha de S.Paulo newspaper reported on Jan. 2 that new Economy Minister Paulo Guedes had drafted a temporary executive decree for Bolsonaro’s signature for a pension reform that could save the government billions of dollars over the next decade.